In an attempt to see as many sick patients as possible, each day has time blocked on the schedule for appointments for sick patients. Please feel free to call first thing each morning if your pet is ill and you are trying to secure one of these appointed blocks. For your protection and that of others, all dogs must be on a leash and properly controlled while in the lobby area or exam rooms. If you do not have a leash, one will be provided for you. All cats, exotics, and pocket pets must be presented in an appropriate carrier or on a leash. Cardboard carriers are available for sale. Please notify the front desk upon arrival if one is needed for purchase. Please call at least 24 hours in advance if you are unable to keep an appointment. The doctor's time has been reserved especially for you, and other clients who want that appointment slot for their pets are told it is unavailable. After hours you can leave a message on our voicemail if you need to cancel or reschedule. Your account may be charged an appropriate office fee for missed appointments. Please call to request medication refills at least 48 hours in advance. This gives the doctor time to authorize the refill and have it prepared and waiting for you to pick up. After hours you may leave prescription refill requests in our voicemail. 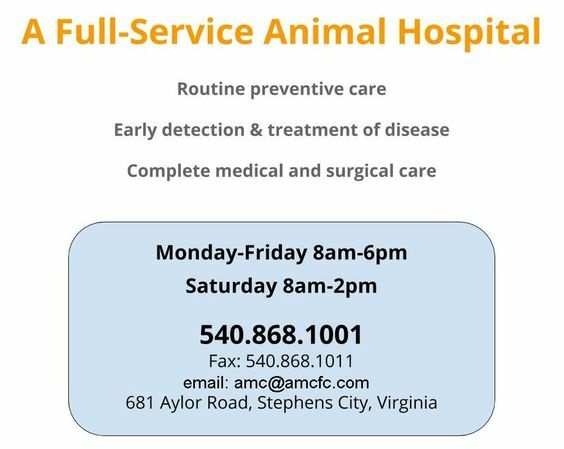 As of 7/1/18, Animal Medical Center can only prescribe 7 days or less of controlled substances or drugs of concern to comply with new Virginia regulations. If your pet is prescribed a pain or anxiety medication, contact us to discuss options. We can provide a written prescription to a local pharmacy or fulfill through our online pharmacy. For your convenience, "drop-off" appointments may be available. A "drop-off" means you could bring your pet at the time that works best for you and leave him/her with us for a couple of hours, after signing a treatment authorization form. Usually we will ask you to drop-off sometime in the morning so our doctors can examine the patient in between appointments or at the time purposely reserved for admitted patients. Once the doctor has completed your pet's examination, he or she will give you a call to go over the diagnosis, treatment, and to give you instructions. There is a small hospitalization charge for drop-off appointments requiring diagnostics and/or medication administration. We require full payment at the time that services are rendered. For your convenience we accept Visa, MasterCard, Discover, American Express, CareCredit, cash and personal checks. We will need your social security number or driver's license number if you are paying by personal check. We do NOT offer a payment plan. Returned checks will incur a fee.